Andy Armitage is a poet and editor from Leeds, West Yorkshire. 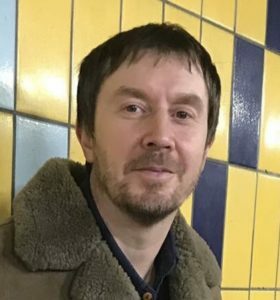 He won First Place in the Leeds Museum Poetry Competition (2017), was Highly Commended in the York Literature Festival Competition (2018) and Commended in the Elmet Poetry Prize (2018). He has a PhD in English after completing a thesis on the myth in Ted Hughes and Sylvia Plath’s poetry at Victoria University of Wellington (NZ). Some of his articles for the British Library and The Ted Hughes Society are below. Which poets influenced your work most, specifically your debut collection? Ted Hughes and W.B. Yeats are probably the poets who have influenced me the most but it was after reading Pablo Neruda’s book ‘Twenty Love Poems and a Song of Despair’ that I decided to write ‘Letters to a First Love from the Future’ – I aimed for 21 poems like Neruda – but ended up keeping 22. Somehow Neruda made love poetry okay for me to write. I don’t think a writer in English had written anything like ‘Twenty Love Poems and a Song of Despair’ and I wanted to write a Northern working class version of his poems. Romalyn Ante described your collection ‘Letters to a first love from the future’ as These beautiful and moving poems, like a special love, will continue to haunt you, long after they have spoken.’ Was this haunting effect something that you were aiming for in the collection? It’s a lovely phrase; Helen Mort and Yvonne Reddick also described ‘Letters to a First Love from the Future’ as ‘haunting’. I think that word readily suggests itself in relation to these poems because the narrator (from the future) is haunted by his past and, in a way, haunts the spaces in the poems by revisiting them and refusing to move on. Your PhD thesis is on the myth in Ted Hughes and Sylvia Plath work. Have they been big influences on your work, if so in what way? Yes, they have both been a significant influence on my writing. They were both incredibly talented in many ways. In particular I admire the unflinching unsentimental register they employ in their poems and the way they have used myths to make particular events/objects/relationships in their lives seem timeless and universally relevant . Which poets are you reading at the moment? Currently reading Kavh Akbar’s ‘Calling a Wolf a Wolf’, a book of poems about alcoholism and and Tom Weir’s Ruin – Tom is one of the emerging poets to watch; I’d highly recommend both books. What next? Are you working on a second collection? I’m working on new poems that I hope will turn into my next book. The last poem I wrote was about the Yorkshire Ripper.